A gift of classical good taste and elegance, this gorgeous display of white lilies turns any occasion into a special one. 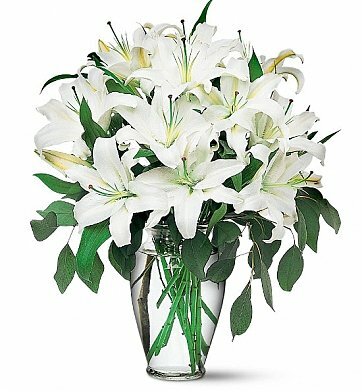 Large, blooming white lilies are artfully accented with eucalyptus and arranged in a stylish clear glass vase. With their simple beauty and sweet fragrance, the lilies send a memorable message of your sentiments. Measures approximately 18" x 21". Magnificent White Lilies is a hand delivered gift. These gifts are delivered by one of our local design centers located throughout the United States and Canada. Same day delivery is available for most gifts when ordered before the cutoff time. The cutoff time for Magnificent White Lilies is 2 PM in the recipient's time zone. THIS IS MY SISTERS FAVOURITE FLOWERS, SO I ORDERED SOME FOR HER ANNIVERSARY. SHE TOLD ME THEY WERE BEAUTIFUL AND THE AROMA IN HER HOUSE WAS AMAZING. SHE IS SO IMPRESSED! SHE ACTUALLY ASKED ME WHERE I ORDERED FROM SO THAT SHE CAN ORDER MORE. I PLACED THE ORDER FROM SCOTLAND AND EVERYTHING FROM START TO FINISH WENT PERFECT WITH NO EFFORT AT ALL. WELL IMPRESSED WITH THIS COMPANY. The lasting beauty and scent of this gift was beyond expectation. Our friends were greatly comforted by this product. Thank you for helping us to provide that support and comfort.